The Queen’s Drive Leisure Area is one of a number of priority projects identified by East Devon District Council (EDDC) in the Exmouth Town Centre and Seafront Masterplan (2011) to aid the economic regeneration of the town and to contribute towards the Vision for Exmouth. Stride Treglown was appointed by the Council in 2012 to prepare a masterplan and secure outline planning permission. The project aims to revitalise existing and new leisure and tourism uses into the seafront site which extends to approximately three hectares. Planning permission secured the introduction of new buildings and the creation of new public and private recreational areas. 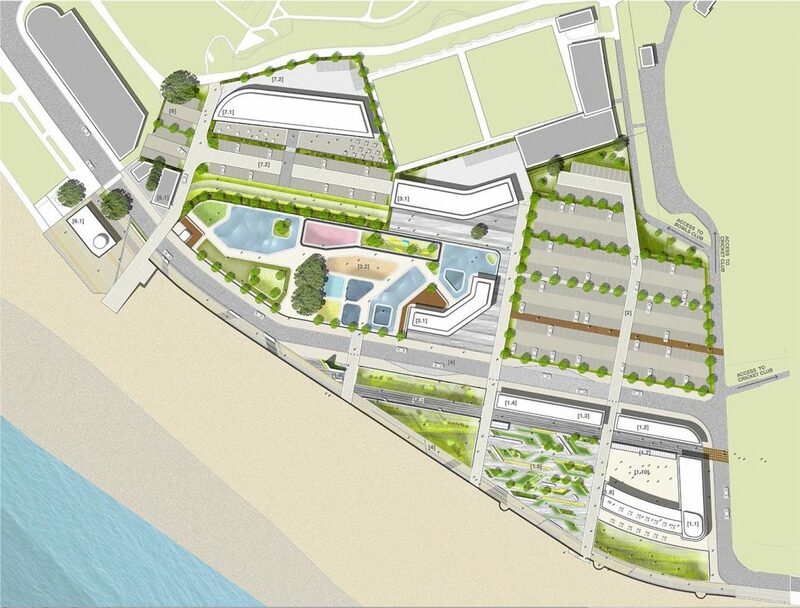 Proposals include the realignment of Queens Drive to strengthen the connection with, access to and views towards, the beach. Stride Treglown led both the Masterplanning process and Town Planning Strategy. We also prepared consultation material and assisted in devising and evaluating responses, working closely with URS (Transport and Geo-Environmental Engineering), Tamar Consulting (Ecologists), Evolve (Arboricultural Consultants), Archaedia (Archaeology Consultants). We coordinated the preparation of an Initial Site Analysis Report in June 2012, Strategic Options (June 2012) and emerging draft proposals in December 2012. Our Town Planning team prepared, managed and collated the preparation of the Environmental Statement and an integrated Planning Design and Access Statement. They also prepared the Conservation Area Appraisal, Socio-Economic Impact Assessment, Landscape and Visual Impact Study and supporting masterplan images for use by the press. Planning permission was granted in November 2013, enabling the marketing campaign to commence.